This is my waveshaper version for the NGF Project. 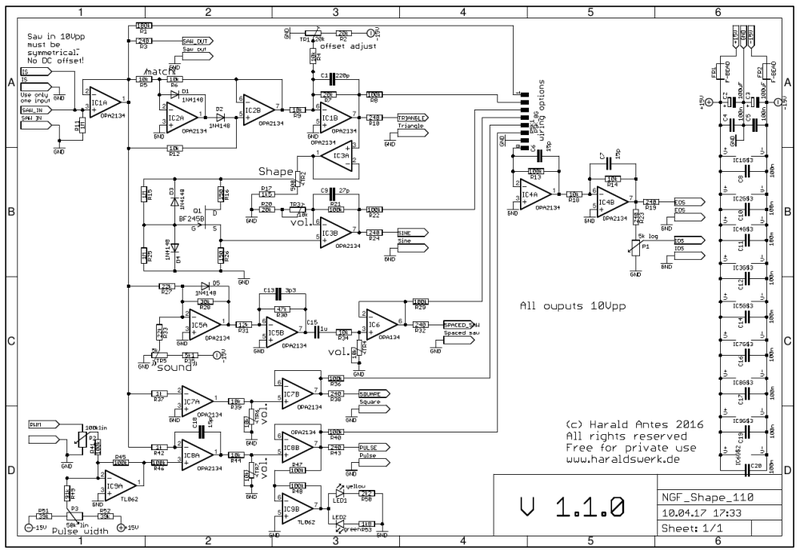 It is basically the same schematic as for my waveshaper version 1.0.1 with an added output circuitry and wiring option to be used with a rotary switch or some SPST switches as in the original. I kept all the waveforms of the original Elektor Formant, but changed the circuitry significantly. The only thing i added is a symmetrical square out, that i found useful for sync. 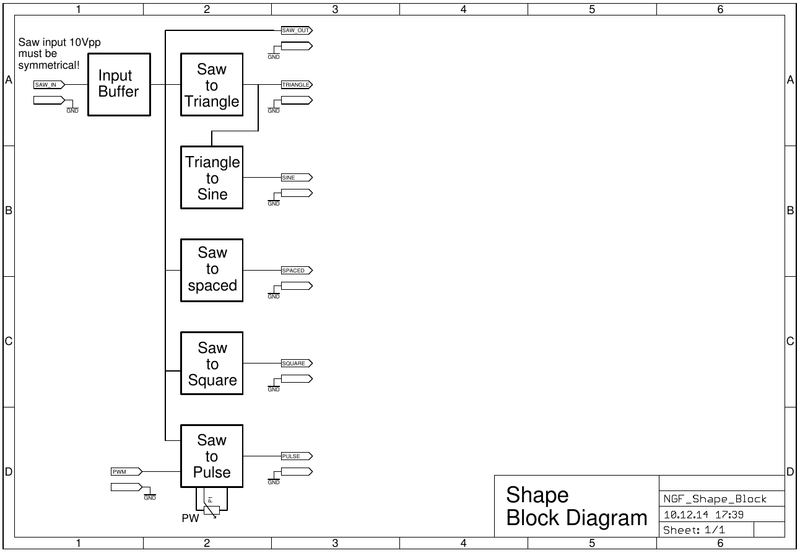 For converting the saw wave to triangle a precision full wave rectifier is used, followed by a level shifter. The originally used matched Germanium diodes are hard to obtain these days. Here you only have to match two resistors. The switching glitch is not audible and can be suppressed with means of a capacitor of some 100pF if wanted. Don't choose the capacitance to high, it rounds the edge of the triangle. For triangle to sine conversion i used a well known circuit that works better then the two diodes approach from the original Elektor Formant. This circuitry can be found at various places in Electronotes and others. 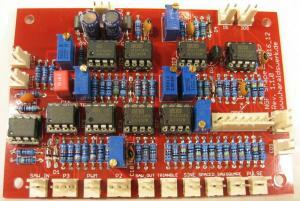 The circuitry is very sensible to the used resistor values and input voltage. The resistor values are done for a BF245B. BF245A or C will not work. If you use another input voltage you probably have to change type of FET and resistor values. For wave shaping from saw to spaced saw I kept the original circuitry from the Elektor Formant. I only have to change some resistor values due to the different signal level. New added is the saw to square waveshaper because I found it useful to have a symmetrical square output. The saw to pulse shaping is quite different to the original but quite standard. Regular input: Symmetric saw 10Vpp. Other input can make some interesting sounds as well. The saw to triangle conversion is done with means of a precision full wave rectifier with offset adjust. This avoids the problem of finding some matched diodes as used in the original Elektor Formant circuitry. The input of a symmetrical saw is a must for best performance! This circuit can be found at various places. The result is better as in the original two diodes approach in the Elektor Formant. But the components and their values must be chosen carefully. See the excerpts from the schematic for detail. Set input to symmetrical saw! -5V..+5V! Adjust TR2 for best sine shape. Adjust TR3 for sine volume. Adjust TR5 for "best" sound of spaced saw. Depends on your preference. Adjust TR4 for spaced saw volume. Adjust TR6 for square volume. All schematic, pictures, drafts, descriptions and other text at the site www.haraldswerk.de and in the associated blog are, if not otherwise mentioned, owned and copyrighted by Harald Antes. They are free for privat use only.